Adjustments? After splitting the first 2 games of the series, both teams will need to make some minor tweaks here or there to pull an advantage. 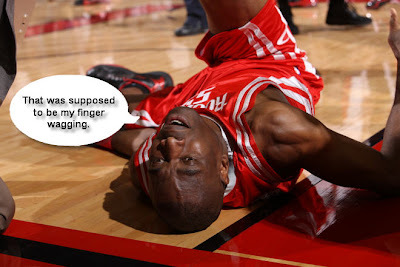 Will it be Yao as the aggressor again? Will the 2-headed Oden/Przybilla monster come back? Will Roy be forced to give up the ball earlier in offensive sets? Maybe a swtich to Battier on Brandon? Maybe a more involved Outlaw? Mutombo-less? When you look at game logs and box scores from Houston's season, Dikembe's name doesn't appear all that often, but when he went down the other night, the Rockets seemed immediately lost. The depth they needed to compete with the size of Portland was gone. In any other series, the loss of a 42 year old might not have been felt, but in this series, it could be the decided factor. No Chance? ESPN is giving Portland almost zero chance at stealing this game. That's not surprising and to be truthful, I have to incredible wisdom to counteract that thought. What I will say though, is that this team has been surprising everyone all season long and this is just another opportunity for this young team to prove how ahead of schedule they are. Aldridge? LaMarcus better be ready to have a career night. Brandon is going to be taken out of this game from the opening tip so it's imperative that Aldridge has a repeat performance. Sure, the other role players like Rudy and Travis need to have solid nights, but this really comes down to LaMarcus. Tickets? I read a brief article or Tweet yesterday claiming that there were still tickets available to the game in Houston tonight. And no, it wasn't a joke. And my love for Portland just keeps growing.